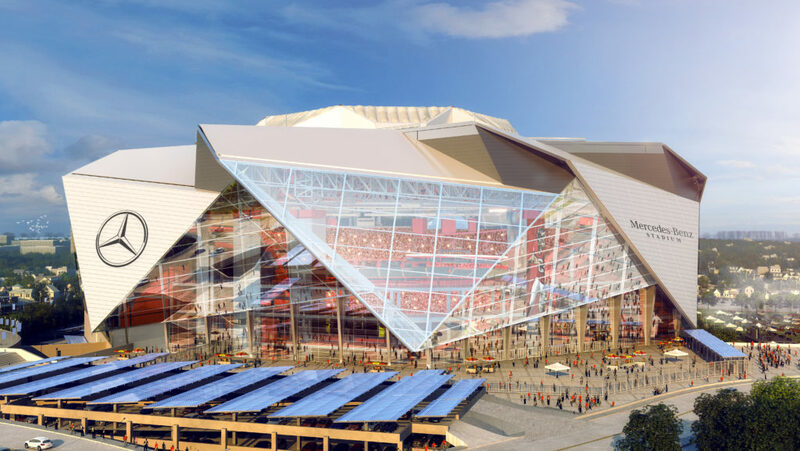 I f much of the last half-century of American football stadium design can be broken down into distinct eras – be it domed stadia in the 1970s and 1980s, retractable roof stadia in the 1990s and 2000s, or the currently emerging wave of transparent-roof venues – Atlanta’s new Mercedes-Benz Stadium might be considered a more unique outlier. It’s not so much that the design by HOK represents a new era, but rather a reinvention of past and present. 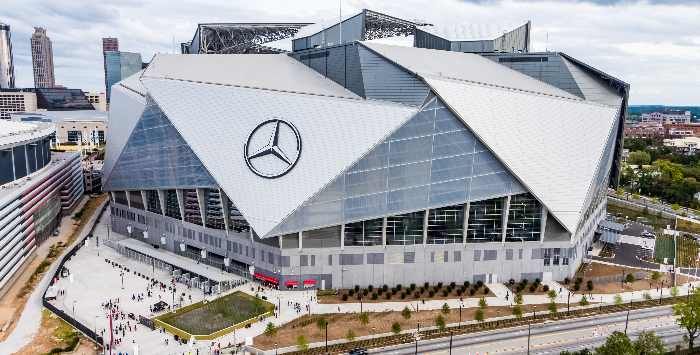 The home of the NFL’s Atlanta Falcons – as well as the MLS’s Atlanta United and a succession of concerts – Mercedes-Benz Stadium’s ambition also reflects changing industry needs. Eye-catching architectural experience is more necessary than ever to attract fans. “The buildings are being asked to really be a spectacle,” says Johnson. Opened in September 2017 and with a budget of more than US$1.5bn, Mercedes-Benz Stadium is the first facility with a retractable roof that opens not with a single side-to-side mechanism, but with eight pieces moving outward from the center, resembling the petals of a flower. Designed by HOK in collaboration with TVS Design and engineer BuroHappold, with Birdair as a specialty contractor for the roof and façade’s ETFE, the roof can open in 10-12 minutes, much faster than comparable stadia. “Our beginning idea was when the roof opened, it needed to be something special and unexpected,” Johnson says. “We imagined this pinpoint of light that, as the roof opened, would grow and become this dramatic opening.” But the execution has also been challenging, subjecting the project to months of delays. The building is noticeably transparent, with more glass and transparent ETFE than even facilities such as Minneapolis’s US Bank Stadium, which has ETFE covering half its roof. Mercedes-Benz Stadium’s angular metal façade on the upper portion of the stadium gives way to whole walls of glass below – manufactured and installed by Crown Corr – which not only can be partially opened to allow natural ventilation, but also gives attendees a view out to the city. With so much transparency, the designers were challenged to balance the desire for light and openness with the extra heat gain that can result. For example, the petals of the roof opening were initially intended to be clear, but mechanical studies showed that “it was impossible to keep the building cool”, Johnson explains. While the roof, video halo display and the views outside will attract the most initial attention, AMB Group and the Falcons paid equal attention to improving the fan experience, holding a series of focus groups and fan councils to learn what ticket-buyers valued most. 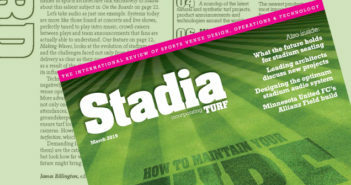 “For so long stadia were about increasing revenue, but in doing that, they’ve often missed how the true fan and their experience is impacted,” McKay says. 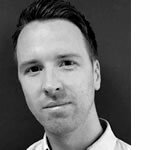 Yet if a great fan experience can be created, he adds, the revenue will take care of itself. 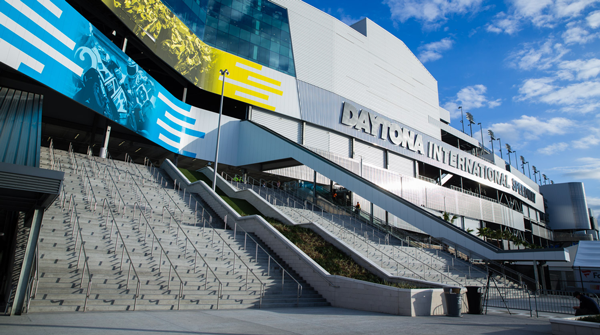 To make sure a high enough volume of fans patronize concessions to make the lower prices still profitable, the owners also sought to improve quality and consistency of concessions.